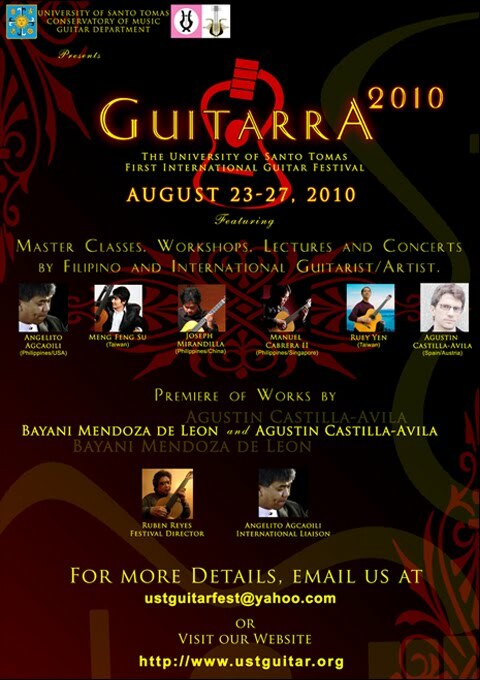 The UST Conservatory of Music, in cooperation with the Foundation for the Musical Filipino, will present the First UST International Guitar Festival from August 23-27, 2010. As part of its artistic contribution to the forthcoming Quadricentennial celebration of the University of Sto. Tomas (UST), "Guitarra 2010" will cover a week of concerts, master classes, lectures and for all devoted to the country's most popular instrument. August 27 - UST Guitar Quartet and Festival Guitar Orchestra, consisting of faculty and students of the UST Conservatory of Music. For the profile and photos of all the featured artists and teachers, click here. For the detailed schedule on the lectures, masterclasses and other activities plus ticket prices, click here. Festival Director and UST Guitar Department Coordinator Ruben Reyes will join the lecturers and panelists. Add UST Guitar Department on Facebook and Multiply. Concerts from August 24-27, 2010 will be held at the Philamlife Auditorium on UN Avenue, Manila at 8pm, while all other activities from August 23-27, 2010 will be held at the UST Conservatory of Music. For ticket inquiries on the concerts and daytime lectures/master classes, please call the UST Music Office at (632) 731-4022 or (632) 4061611 loc. 8246.